Members should complete the Fiddlers’ Festival opinion poll at this week’s meeting or next. Steve Boehm delivered the pink guitar to its winner, Joanna. Pay and tell with Sergeant at Arms Andrew Chung. Potential Rotary Leadership Seminars (PRLS) is open to Rotarians and their families. Daniel Ramirez put his public speaking Master PRLS skills to work with a short speech about the program. The club collected more than $600 for Super storm Sandy relief, which the club foundation will match. Susan Klein-Rothschild and David Velarde presented the student of the month to El Puente student Melina Arzate. Melina was joined by her teacher, Cecilia Molina, and her father, Armando Arzate. Melina returns to Dos Pueblos High School to graduate this year. The District Foundation Gala will be January 25 at the Holiday Inn in Goleta. We have about 19 guests from our club. The Symposium to End Poverty Sustainably (STEPS) will be January 26 at UC Santa Barbara. It’s free. Register online. 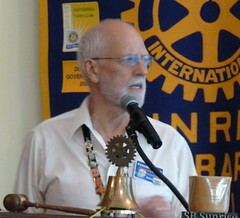 http://www.rotarystepsonpoverty.org. The Rotary International Convention will be in Lisbon, Portugal, June 23-26. Register at Www.riconvention.org. It’s Rotary Awareness month. Wear your Rotary pin to spark conversations and tell people about Rotary. 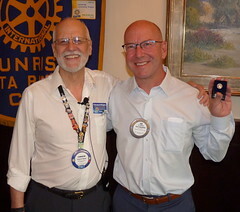 Our district has added 109 members this Rotary year. There will be a standup board meeting following the meeting. Last week’s rendezvous was lonely for Ed Flemming. This week’s rendezvous returns to Brewhouse at 5:30 PM on Thursday. Today is hot and spicy food day. Kimberly Coley won the raffle. David Velarde raffled off wine tastings. Maurice was born in St. Thomas in 1972, and his family moved to Rio, Brazil, the following year. His father ran a jewelry store. He was very active in sports, including skiing, sailing, horseback riding, surfing, snowboarding and more. In 1990, the family won a De Beers Diamond Award for jewelry design. He moved to Buzios in 1992, and he opened the first Swatch store in Brazil. He returned to Rio in 1998 and began working with his dad at the jewelry store and falling in love with colored gems. In 1999, his first child was born and he launched his own jewelry designs. In 2003, his son was born, and he created a new jewelry collection and won a prize. 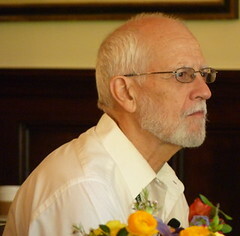 He moved to Santa Barbara in 2006. He began his business at the Cabrillo art walk. He started driving limos to pay the bills, and he continued working on his jewelry. He started to get recognition for his work. ThroughWomen’s Economic Ventures, he became more business savvy and ultimately opened his own jewelry store on State Street. He’s been with his wife more than 3 years. Baby Caroline was born in 2012. Craft talk by Janet Napier, past president 2002-2003. Janet was born in UK. Her mother was a role model for community service. She worked in the export department of a canned ham company in Copenhagen, Denmark. The job was boring, but the night life was good. Then she returned to London and worked as an executive assistant. She dated an English professor, and travelled to India with him. The trip was quite an adventure, including a bus breakdown in Afghanistan. She trekked in the foothills of the Himalayas. Along the trip, fellow American travelers kept comparing the different landscapes to places in the U.S., so she decided to go to the U.S. Her boyfriend was at Stanford, so she went to San Francisco. She planned to stay for about two years, and she’s still in California. She found a job as assistant to the director of the San Francisco Opera. After a year, she went to work for the YMCA. She was instrumental in opening it to women. She later became the executive director of a new Palo Alto YMCA. Then she supervised eight branches in Los Angeles. Become a U.S. citizen in 1976, the bicentennial. 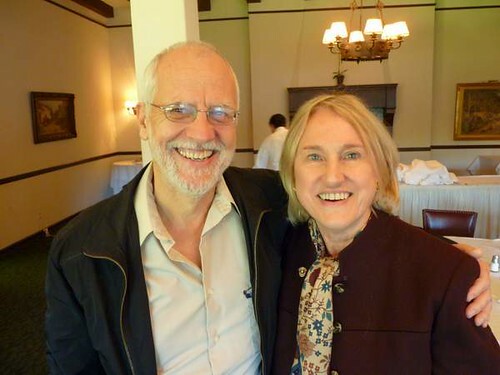 Janet met Connard Hogan in Palo Alto, and when she moved they maintained a long-distance relationship for awhile before Connard moved to join her in Santa Monica. Janet then moved to Santa Barbara, where again, Connard later joined her. After leaving the Y, she moved her career to Easter Seals. She’s a volunteer for the Red Cross, the SB International Film Festival and Rotary. She lawn bowls. Connard and Janet have been married 20 years.